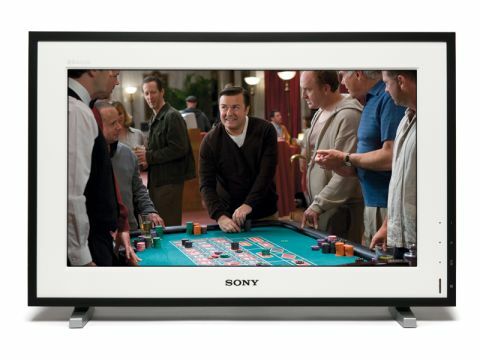 Is Sony's frame a picture perfect small HDTV? Most small TVs are either really basic, or really rubbish, but not so this Sony 22E5300 that's so packed with features and, yes, quality that it humbles many TVs twice the size. You can tell at once that the KDL-22E5300 is something special, because in place of the usual shiny black or plasticky grey rectangle is a gloss white main bezel, offset to eye-catching effect by a slim outer black frame. The design resembles some kind of high-tech digital picture frame. This is undoubtedly deliberate, and reflects the TV's really quite remarkable multimedia affinities. For instance, there's an Ethernet port you can use to access multimedia fodder on a connected DLNA-certified PC. What's more, this port can also connect up to Sony's AppliCast online service, which includes a small selection of digital photos and artworks you can download to use as low-power screensavers. The discovery of the high spec Bravia Engine 3 video processing on such a small TV is an emphatic indication of just how seriously the company is taking its 22in 'baby'. It's obvious as soon as you sit down to watch the 22E5300 that Sony's attempts to inject real quality into the 'portable' market have paid off handsomely. Its black level response, for instance, is way ahead of the rest of the 22in pack, delivering dark scenes with scarcely a trace of the dreaded grey mist that so blights so many small LCD TVs. Also superb are its colours. Hues across a noticeably wide spectrum are pushed forth with dynamism and fulsome saturations, while tones in general, and even tricky complexions, are strikingly credible. Motion is fluid and only marginally affected by LCD's blurring problem, too. This makes it easier to appreciate the TV's ability to commandingly render the crispness of good HD sources, as well as the exceptional way the BE3 processing upscales standard definition to the HD Ready screen. With only some minor noise over fine details to occasionally spoil the otherwise excellent pictures, and some unusually potent audio keeping the tip-top images company, the 22E5300 really does set a new benchmark for the small TV market. So long as you don't mind paying a premium for it.